Simon's latest adventure takes us back to the hottest continent on earth, Africa! Our last visit to Africa was on Simon's Mountain Gorilla Adventure, but this time we're checking out the largest land animal on the planet, The African Elephant. Along the way you'll also meet the African Dung Beetle, the tiny bug who spends it's life cleaning up after the elephants, and loving it! Here's a Link to a Fantastic Page where you can download different Elephant colouring in sheets, and even an Elephant Word Search. 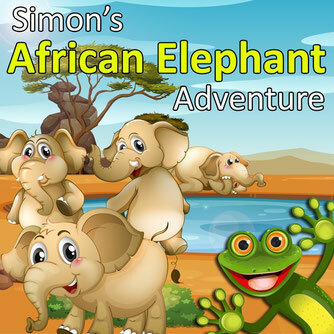 When your kids listen to Simon's African Elephant Adventure, they won't just be entertained, they'll be learning too! No matter what the movies tell you, Elephants don't like peanuts! African Elephants are the biggest of the two Elephant Species (The other is the Asian Elephant), and amazingly, the easy way to tell them apart is by stretching out their ears. The African Elephant's ears actually look like a map of Africa! They're so good at finding their way through the forests with their trunks, they could do it blindfolded. In fact there are documented cases of blind elephants leading the herd. They can recognize themselves in a mirror. Elephants and dogs are the only animals that understand pointing. A grown elephant eats around 150 KG of vegetation every day. A grown elephant will also produce around a ton of manure every week, which is then cleaned up by the hard working Dung Beetles! They only rest for a couple of hours a day, and can go for days without sleeping if they have to. You might think they're loud but you can't hear most of the sounds an Elephant makes. They're called Infra sounds and are too low for humans to hear. They might be the biggest land animal in the world but the're afraid of Bees and Ants because they can get inside their trunks. Their skin can be up to an inch thick but it's sensitive enough to feel a fly land on it. Bonus Facts About Dung Beetles! They have a brain the size of a grain of rice but they can navigate using the Sun, the Moon, or the Stars! They've been around for 65 Million years so they were cleaning up after the Dinosaurs. They are actually fussy eaters. Aussie Dung Beetles weren't interesting in cleaning up after cattle, they only liked marsupial poo, so other Dung Beetles had to be imported from overseas to do the job! They are excellent parents and will sit for up to 6 months next to the dung ball their babies are growing inside. 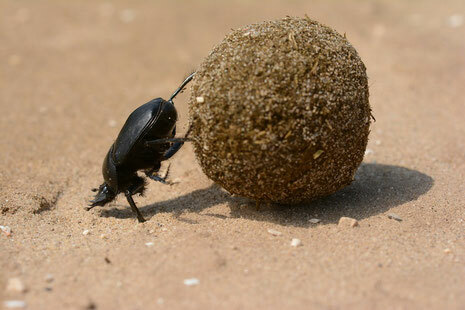 Sometimes they have to fight off other Dung Beetles who try to steal their dung ball. They were worshipped in Ancient Egypt (Scarabs). They do like it fresh, and a whole elephant dropping can disappear in 15 minutes, thanks to an instant army of 12,000 beetles.